Spanish explorers in the mid-sixteenth century ranged over the American Southwest. They had come north from Mexico, looking for gold and gems and the legendary Seven Cities of Cibola (pronounced SEE-bow-lah), allegedly filled with such treasures. In their quest, they found neither gold nor riches. They did, however, become the first Europeans to view the geological wonders of the area, and they were amazed at what they saw. Among the canyons, plateaus, and rock towers and arches, the explorers saw landforms that appeared plateaulike, only smaller and isolated. They called these geologic features mesas (pronounced MAY-suz), which means table in Spanish, because the explorers thought the landforms resembled tables with their smooth, flat tops and sides that drop away steeply. Populating the spare, arid (dry) landscape of the area along with mesas were still smaller landforms that had a similar appearance. At the beginning of the nineteenth century, the word butte (pronounced BYOOT) was coined from the French word meaning mound or hillock to describe these solitary landforms. landform that is wider than it is high and a butte as one that is higher than it is wide. A mesa's and butte's characteristic shape—flat top and clifflike sides—is due to the layers of rock forming them. These landforms are most often composed of sedimentary rock, formed by the accumulation and compression of sediment (which may consist of rock fragments, remains of microscopic organisms, and minerals). This type of rock covers more than 75 percent of Earth's land surface. Most sedimentary rocks occur in layers, called strata, that are mostly horizontal or flat when first formed. Forces within Earth that rupture the surface to form volcanoes, mountains, plateaus, and many other topographical features (physical features on the planet's surface), may later cause these layers to tip, fold, warp, or fracture. 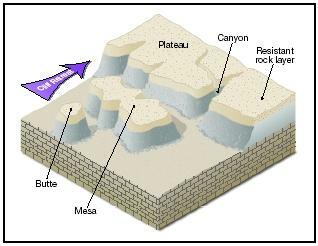 The top layer of a mesa and a butte is a hardened layer of rock that is resistant to erosion, which is the gradual wearing away of Earth surfaces through the action of wind and water. Sometimes this top layer, called the cap rock, is not sedimentary rock but is cooled and hardened lava that had spread out across the landscape in repeated flows from fissures or cracks in the ground. Beneath this flat protective cap of rock are horizontal layers of softer sedimentary rock. To varying degrees, these layers are not as resistant to erosion. These landforms are found in arid and semiarid regions. Arid regions are defined as those that receive less than 10 inches (25 centimeters) of rain per year; semiarid regions receive 10 to 20 inches (25 to 50 centimeters) of rain per year. Precipitation in these regions often comes in the form of sudden, heavy rainfalls. Because water evaporates quickly in these normally dry environments, plants and other ground cover are scarce. Left exposed to the action of running water, the bare sides of the softer rock layers of mesas and buttes are eroded away over time. The base of these landforms is often gently sloped, contrasting with the almost-vertical sides leading down from the top. Rock material that has been eroded from the sides is carried downward, forming this sloping base. A narrow, deep, rocky, and steep-walled valley carved by a swift-moving river. Erosion-resistant rock that overlies other layers of less-resistant rock. A high, steep face of rock. The thin, solid, outermost layer of Earth. A tall, slender tower or spire of rock. A relatively level, large expanse of land that rises some 1,500 feet (457 meters) or more above its surroundings and has at least one steep side. Layers in a series of sedimentary rocks. Mesas and buttes do not arise as completed landforms through sudden geological events. They have been shaped over millions of years by the slow, orderly process of erosion. They are part of a series of landforms that naturally erode into other landforms. That series begins with plateaus, which are relatively level, large expanses of land that rise some 1,500 feet (457 meters) or more above their surroundings and have at least one steep side. A mesa is an isolated, flat-topped hill or mountain with steep sides that is smaller in area than a plateau. A butte is also a flat-topped hill with steep sides, though smaller in area than a mesa . Rivers erode by picking up sediments (loose rock fragments) and transporting them to a new location. The speed or velocity at which a river flows determines the size of the material it can carry. A fast-moving river carries more sediment and larger material than a slow-moving one. The sediment acts as an abrasive as it is carried along, scouring and wearing away the banks and bed (sides and bottom) of the river. As new material is eroded, the river picks it up. In turn, this new sediment helps the river cut even deeper into its channel. Geologically speaking, no landscape is ever "complete." The surface of the planet is in constant motion. As new landforms are built up, others are eroded away. As vast as it may seem, a plateau is relentlessly carved by erosion. The Colorado Plateau in the four corners region of the American Southwest is eroding at a rate of 500 vertical feet every 1 million years. Deep valleys and canyons form steep cliffs that retreat endlessly as water from storm runoff and streams and rivers washes away soft rock. Were it not for sections of resistant rock on the surface of a plateau, the entire landform would wear away over millions of years to a valley floor. Those resistant sections allow a plateau to erode into mesas that rise above the ever-widening valley floor. Mesas maintain their shape because their cap rock offers protection to the layers of softer rock beneath. That protection, however, is short-lived. Again, water from storms washes over the sides of the mesa, wearing them away. As the sides retreat inward, the overhanging sections of cap rock weaken, fracture, and fall. 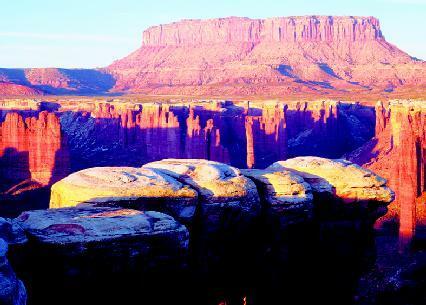 As the process of erosion continues, a mesa shrinks in size. Over time, it becomes a butte, taller than it is wide. Unrelenting, water erodes the butte as it had the mesa before it and the plateau before that. Capped by its resistant rock but ever shrinking, the butte may eventually erode into a pinnacle. This tall, slender tower or spire of rock will stand until it, too, succumbs to erosion and eventually crumbles to the valley floor. In July 1976, the planetary probe Viking 1 orbited Mars searching for a potential landing site for a sister probe, Viking 2 . While photographing areas of the Cydonia region of the planet, the probe captured an image of a landform that resembled a face with darkened eyes, a narrow nose, and a frowning mouth. When the National Aeronautics and Space Administration (NASA) released the image to the public, it caused a sensation. NASA scientists reasoned that sunlight on the landform created the apparent image, but many people thought otherwise. They believed that the face was artificially created. It was proof, they asserted, that intelligent life existed on Mars. More than twenty years after the Viking 1 probe was released, NASA sent another probe to Mars, the Mars Global Surveyor . 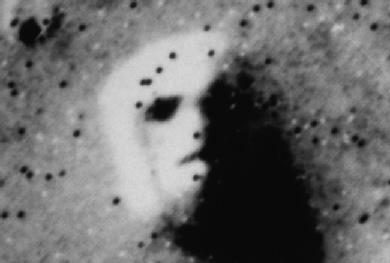 In early 2001, after having taken tens of thousands of images of the planet, the Surveyor aimed its strong camera lens on the "Face of Mars." This time, the image clearly showed that the landform was simply another mesa in an area of mesas and buttes, very much like those that exist in the American Southwest. In west-central New Mexico stands a mesa made of sandstone, a type of rock composed of grains of sand bonded together by a mineral cement, like calcium carbonate. The mesa rises impressively 430 feet (131 meters) above the surrounding valley. Known as Enchanted Mesa, it was called Mesa Encantada by Spanish explorers and Katzimo by the Acoma (pronounced AK-ah-ma), the Native Americans who inhabit the area. The Acoma live in a pueblo (Native American village) on top of another sandstone mesa located a few miles away from Enchanted Mesa. The pueblo, believed to have been founded in the twelfth century, is the oldest continuously inhabited community in the United States. 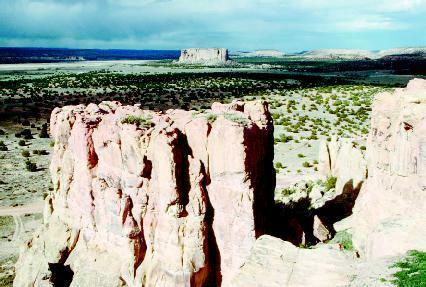 According to Acoma legend, Enchanted Mesa is the ancestral home of the Acoma people. They lived on top of the mesa. One day, when the Acoma were tending their fields in the surrounding valley, a violent rainstorm arose. The rain washed away the stairway leading to the top of the mesa, leaving the elderly and the very young stranded on top. They eventually died from starvation. Another version of the legend states that only an old woman and her granddaughter were stranded on top. Rather than face certain starvation, they leapt to their deaths from the top of the mesa. Spanish for "green table," Mesa Verde (pronounced MAY-sah VURD or VUR-day) is a deeply carved mesa in southwest Colorado. The mesa is so-named because sagebrush, yucca, and other vegetation cover the area around it, while pinyon pine and juniper grow on its top. Unlike most mesas, the top of Mesa Verde is not completely horizontal, but tilts upward from south to north. Its north side rises nearly 2,000 feet (610 meters) above the valley below. Over millions of years, erosion has carved out the sides of the mesa. Overhangs and alcoves have developed where sections of softer sandstone layers have broken away. Mesa Verde is perhaps more noted as a cultural landscape. Archaeologists estimate that twenty-four Native American cultures have had some connection to the area. Prominent among these were the Anasazi, who are believed to have been the ancestors of the modern Pueblo. For more than 700 years, from approximately 600 to 1300 C.E. , their culture flourished at Mesa Verde. In the sheltered alcoves situated high on the mesa's sides, the Anasazi built their dwellings. Ruins of these elaborate stone structures survive to the present day. Archaeologists are not quite sure why the Anasazi abandoned their dwellings abruptly after so many centuries. Lying entirely within the Navajo Indian Reservation on the border between southeastern Utah and northeastern Arizona is Monument Valley. Filled with striking mesas, buttes, and pinnacles, it is one of the most recognizable landscapes in the entire American Southwest. Countless Hollywood films have used the sandy region as a background, from Stagecoach (1939) to Forrest Gump (1993). More modern advertisements and television commercials are shot in Monument Valley than anywhere else on Earth. sedimentary rock layers of the plateau produced these isolated geological monuments. Many of the rock formations in Monument Valley have been given names that describe their shape: East and West Mitten Buttes, Thunderbird Mesa, and Totem Pole (pinnacle), among others. The Navajo have occupied the area since the 1860s. Their history in the region, along with other Native American cultures, dates back centuries. Ancient ruins, petroglyphs (rock carvings), and pictographs (rock paintings) have been discovered throughout the area. DenDooven, K. C. Monument Valley: The Story Behind the Scenery . Revised ed. Las Vegas, NV: KC Publications, 2001. Martin, Linda. Mesa Verde: The Story Behind the Scenery . Revised ed. Las Vegas, NV: KC Publications, 2001. Smith, Duane A. Mesa Verde: Shadows of the Centuries . Revised ed. Boulder: University Press of Colorado, 2003. Butte . http://geology.about.com/library/bl/images/blbutte.htm (accessed on September 1, 2003). "Geology of Fieldnotes: Mesa Verde National Park." National Park Service . http://www.aqd.nps.gov/grd/parks/meve/ (accessed on September 1, 2003). Mesa in Sedimentary Rocks . http://geology.about.com/library/bl/images/blmesased.htm (accessed on September 1, 2003). Mesas and Buttes . http://www.scsc.k12.ar.us/2002Outwest/NaturalHistory/Projects/WylieT/default.htm (accessed on September 1, 2003). VERY VERY GOOD SITE.I REALY LIKE IT.YOU HAVE REALY GOOD IDEAS TO HELP THE STUDENTS. at the base of a mesa or a cliff? I am writing an article on the John Ford westerns. Your informative site was very helpful. This has helped in my report writing. Thanks. It's a very good site. 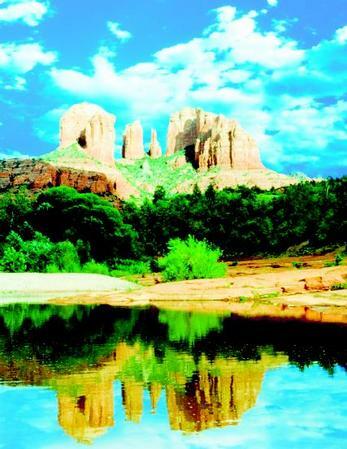 Unfortunately, the picture has nothing to do with Monument Valley - it is of a formation a couple hundred miles away in Sedona, AZ - Cathedral Rock! Just got back from Big Bend, Texas and Davis Mountains. Couldn't figure out why all those (buttes?) had 'tops' that seemed to all be at the same height. This just explained everything I saw in ten minutes. Thanks! Very Good! Helped me. I usually don't write reviews but you helped me on my lab for earth science!